It has been a busy week at work with so very little progress has been made in the shop though I did finally get the saw till hung on the wall. This weekend I finally glued on the last side of the main case. In preparation, I ordered two new Bessy H style pipe clamps off of eBay as I realized I needed at least 6 clamps for the side (9 would have been better) and I only had 4 that were big enough. The other two pipe clamps I have are from Harbor Freight and there was no comparison, buy the Bessy, they are worth the extra few dollars. For once, a glue up went without a hitch though I ended up using one of my extra long clamps to hold the side on instead of the top and bottom which was less than ideal. 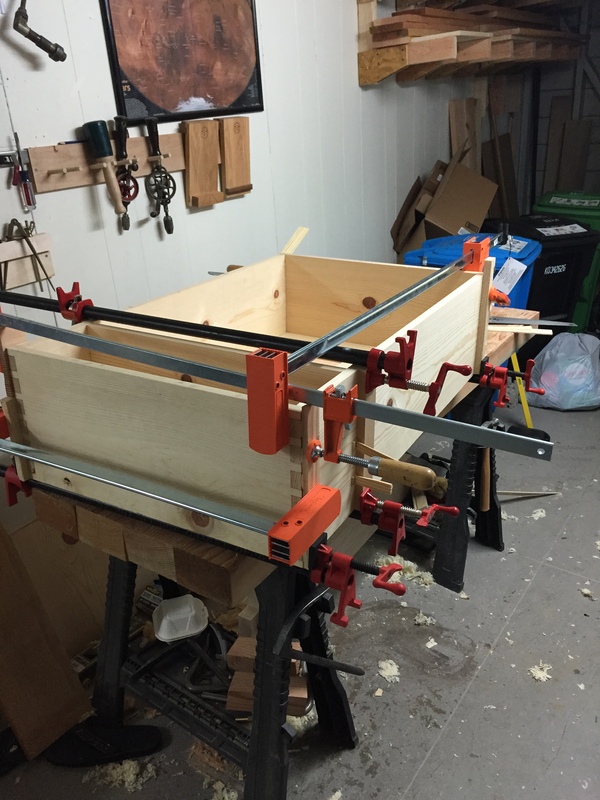 On Sunday the clamps came off; I trimmed off the trough tenon wedges; and assessed the end results. There were some dents on the front edges and some minor height variations where the case sides met the top and bottom. I steamed out the dents with a Clothing Iron and a damp rag then I planed the front edges until they lined up (by pure luck the edge gain for three of the sides ran continuous making this process much easier). The tails on the bottom were trimmed flush with a block plane and my smoother but the rest will wait until I get a chance to hone/sharpen my tools (my stones are covered in construction debris and need cleaning). I also filled some of the bigger gaps in the upper left dovetails with pine shims (see the picture) to tighten everything up for the inevitable glue failure. 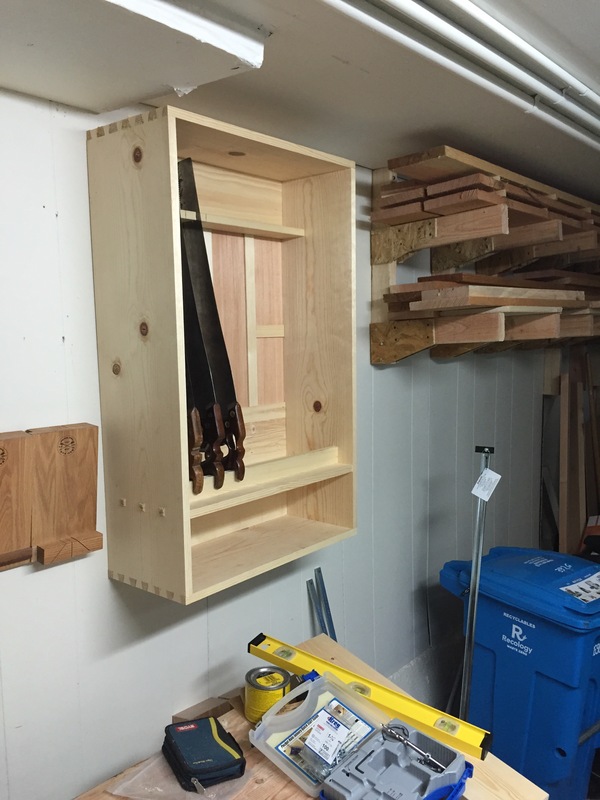 Now it is time to build the actual saw racks and the french cleat so I can get this thing off my bench. 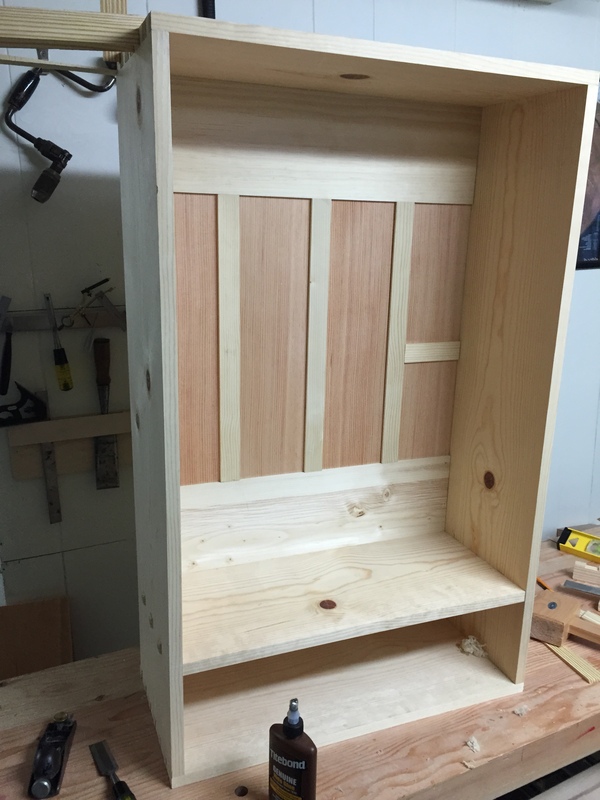 The door and drawer will wait until my bench is finished. 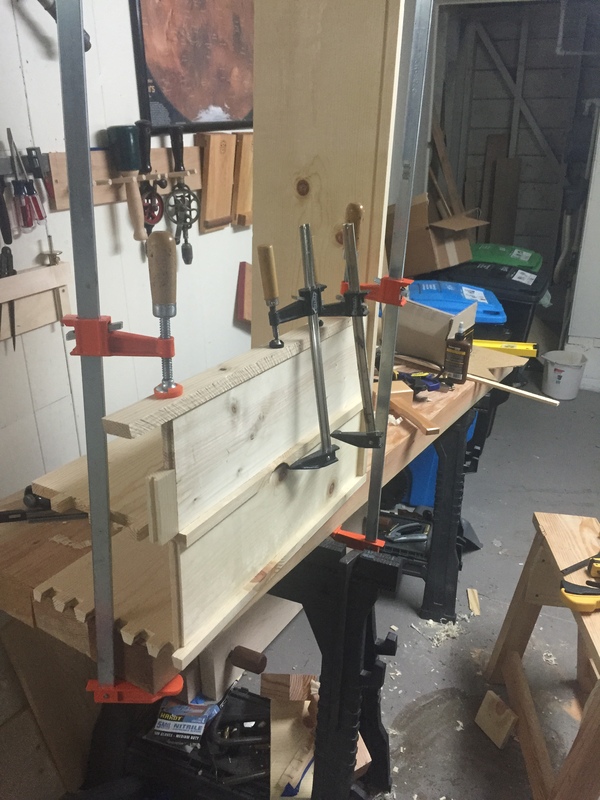 You will notice that even though I have more clamps I still need more. 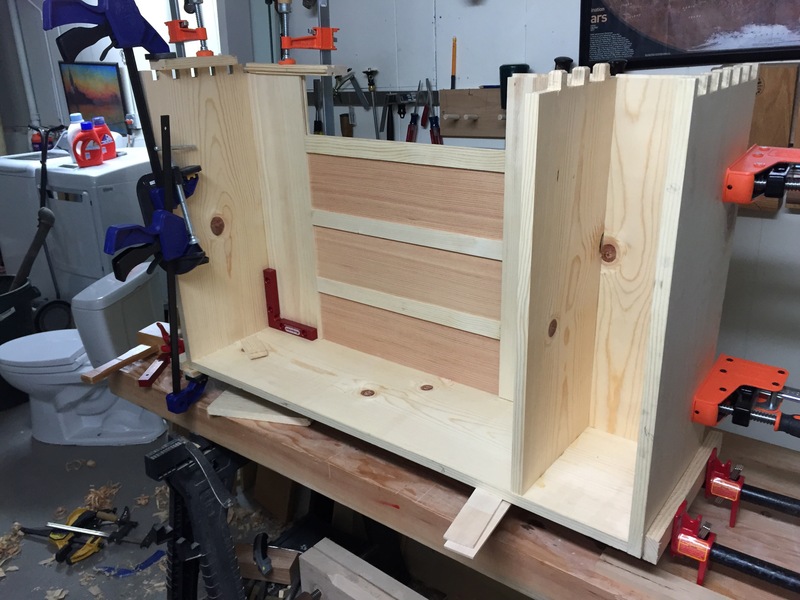 Just once I would like a large glue-up to go off without a hitch. Last night I glued the top and back panel into place and it was a mess. After a dry fitting that went together fine I took everything apart, made some clamping blocks, and laid out the readjusted clamps on my bench. Then I brushed liquid hide glue on each piece and assembled the back and slid it into place (by badly cut dovetails in this corner as what allowed me to assemble it in this manner). 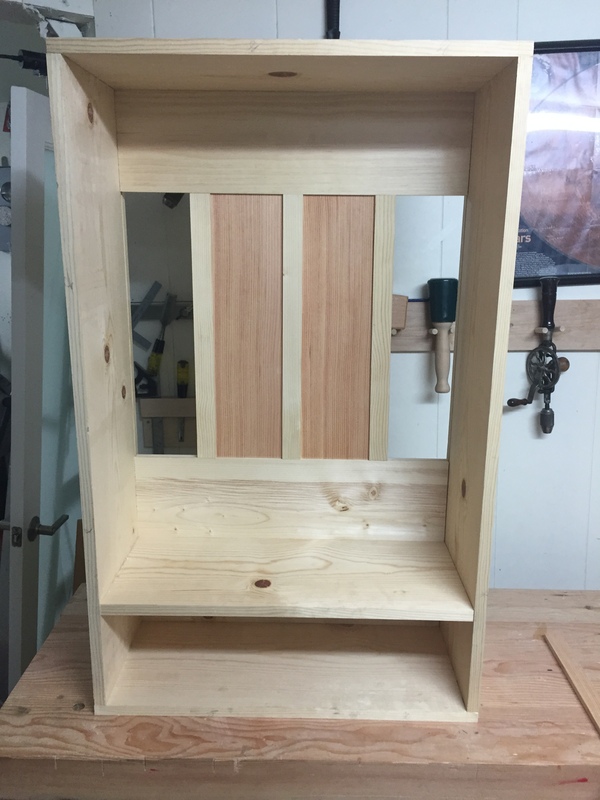 I start hammering and clamping joints closed and realize that top piece of the back panel wont seat with the side (right by the red WoodPecker angle piece). Fist I try a mallet, no luck, then I try to clamp it which resulted in damage to the tongue (and cursing, thank goodness my son was asleep). I finally give-up and take the whole assembly apart (score one for the long open time of liquid hide glue) and trip down the Douglas fir panel with a hand plane and the joint goes together with no problem. Okay, add a bit more glue and put it all back together; wont go together again in the same spot. At this point, I am livid and decide this joint is going together even if it breaks something. 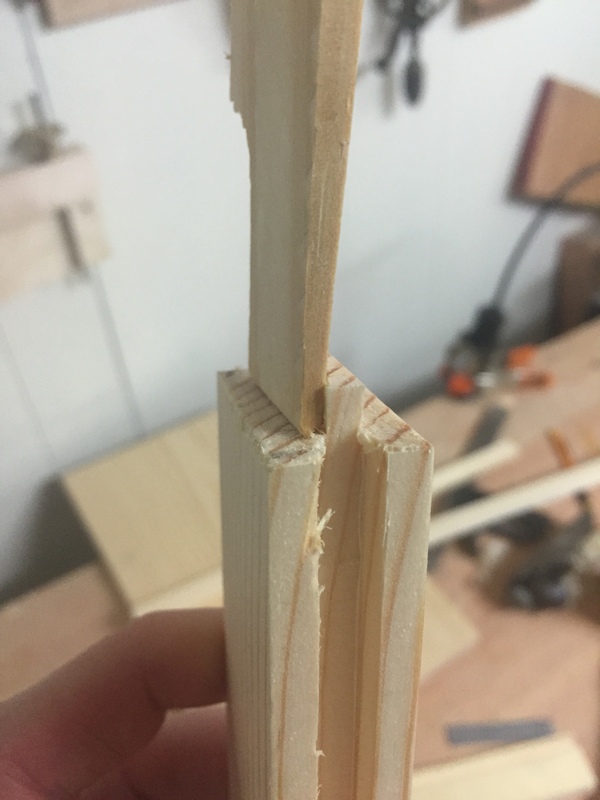 I find a scrap piece with a groove in it that matched the tongue and release ever clamp except the one right over the joint and I crank it down, HARD. It finally goes together, thank goodness, and I tighten every clamp down. The back corner is a bit out of alignment but the front edge is square so I can live with that. 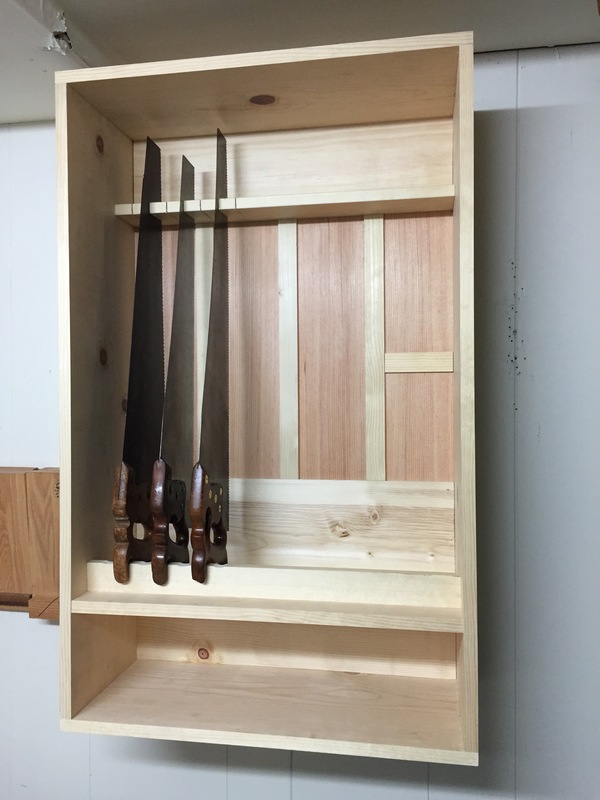 With the lumber rack finally complete I was able to focus on the saw till again. The two ready back panels were cut down to size and then received a rabbit (rebate) around the edges using my Stanley 45 and Veritas medium shoulder plane. 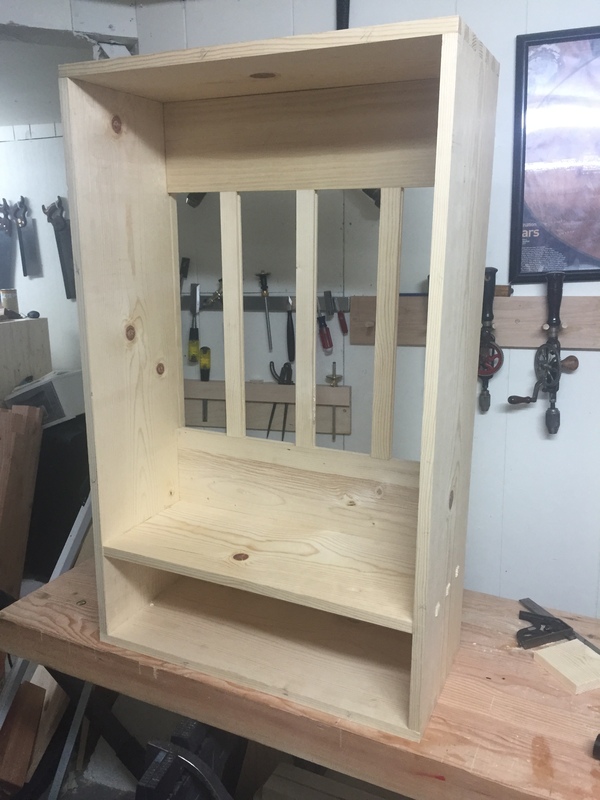 A quick test fit showed that things went together well though I may need to trim the vertical dividers a bit. Next it was time to resaw another piece of the Douglas fir to make the remaining back panels. 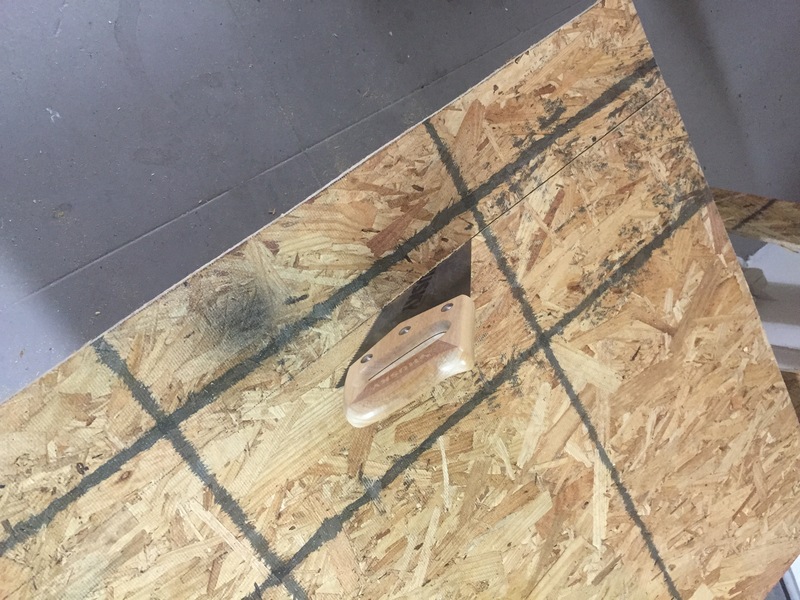 I marked out where I wanted the saw kerf to go and started the end grain cuts with the board vertical before moving to the saw horse to cut the side kerfs. 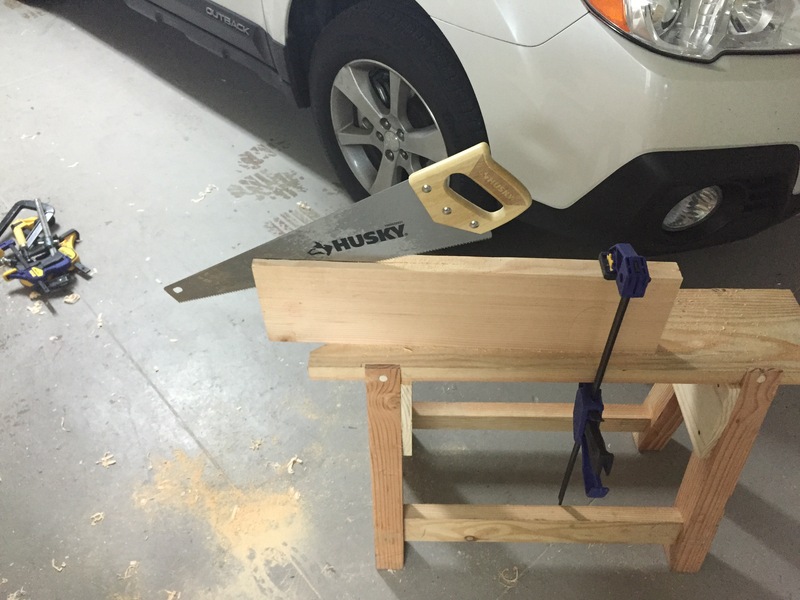 You will notice I am using a the same modern disposable saw that I used for the strand board; my rip saw was very dull when I purchased it and I have never sharped a saw before so I figured I would try with the Husky. 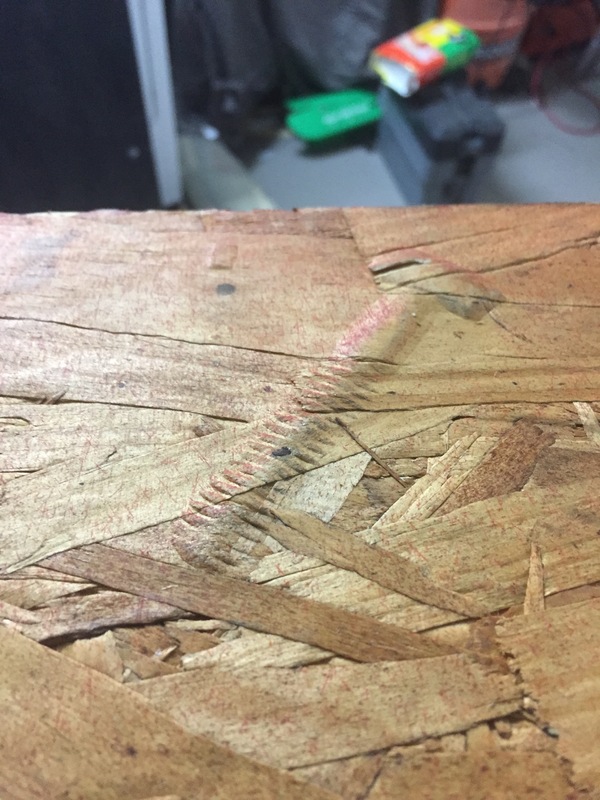 I have never resawn by hand before but I think this may have been a mistake as the cutting was very slow and it kept jumping the kerf I had made (hard to tell if this is just a lack of skill or the set of the saw). After an hour my hands were sick of the handle and my body was worn out; I had made it through less than 20% of the board. My next post will likely be related to sharpening a rip saw. 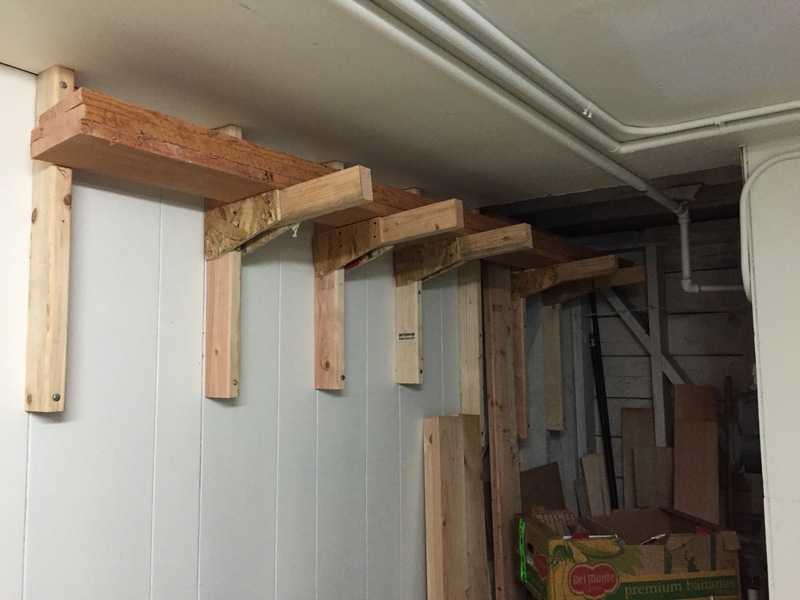 The contractors took over most of the garage (they found a rotten subfloor and joists in the bathroom when they ripped up the floor; the joys of 100 year old houses) so I didn’t get much work done during the week but I spent Saturday finally finishing up the lumber rack. I used some strand board that was left over from an old crate (my pack rat tendencies paid off once again) and since it was cheap processed material I picked up a cheap modern disposable saw and cut it into strips. 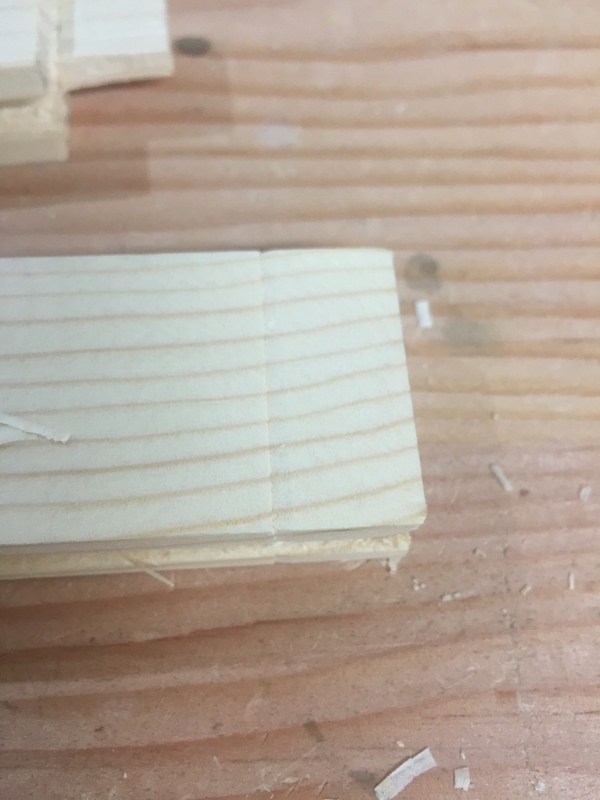 While cutting out the pieces I noticed this odd bump in the strand board which I decided to cut around since it looked like a screw inside the board (bulge looked the same on each side) but when when I split it open there was nothing. Using some leftover drywall screws as clamps I glued the strand board to the 2×4 pieces. 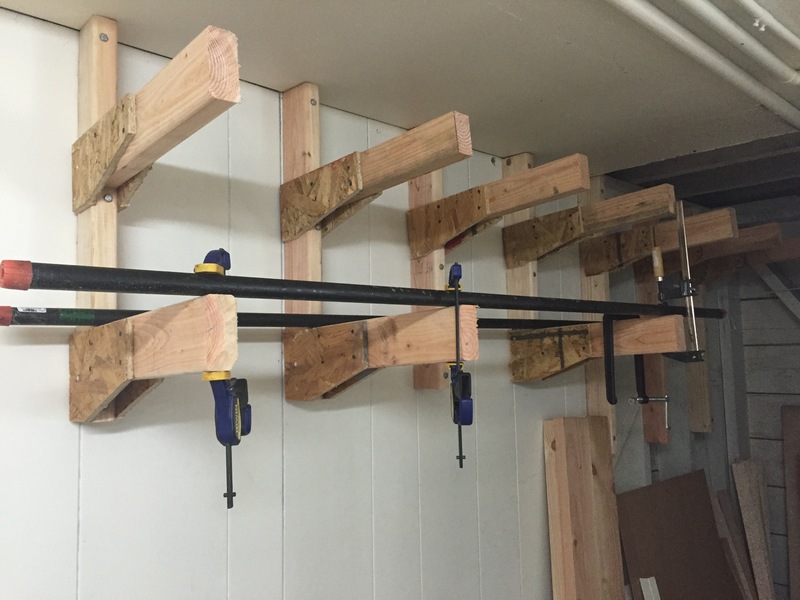 In order to make sure the braces are all the same height I used a 6 foot pipe and some clamps. 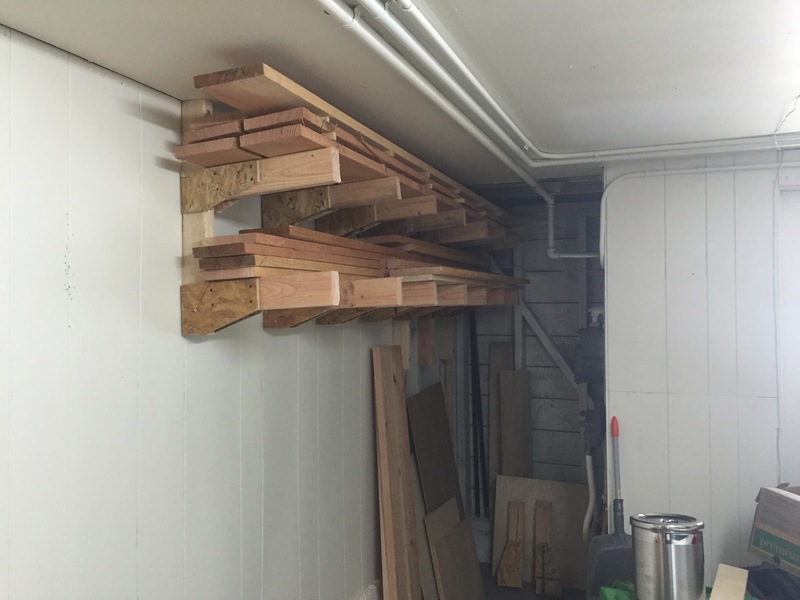 It’s not clear but each of these angle up a few degrees, hopefully this will keep the boards in place during minor quakes. My new Douglas fir got some stickers while it acclimatizes to my shop. The garage looks a lot less cluttered. Didn’t get anything done on the saw till thanks to the lumber rack and getting the house ready for the contractors tomorrow. Still need to build a few more supports but it’s a start. Harvey Ellis Saw Till – Part 8 – The Back cont. Between a sick kid and the sick parents that followed, last night was the first shop time in quite a while. 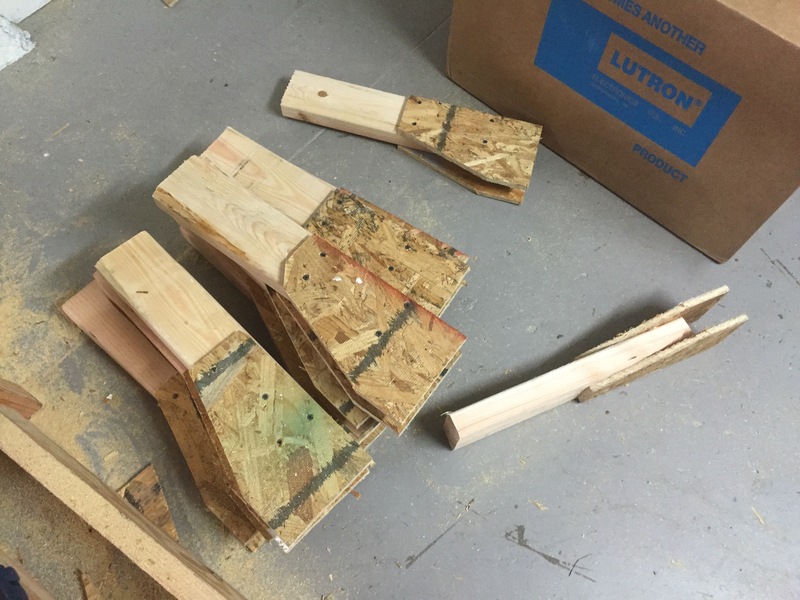 In addition to finishing the repair to the tenon that ended up to thin, I cut the two remaining tenons for the back dividers and made sure everything matched in size. 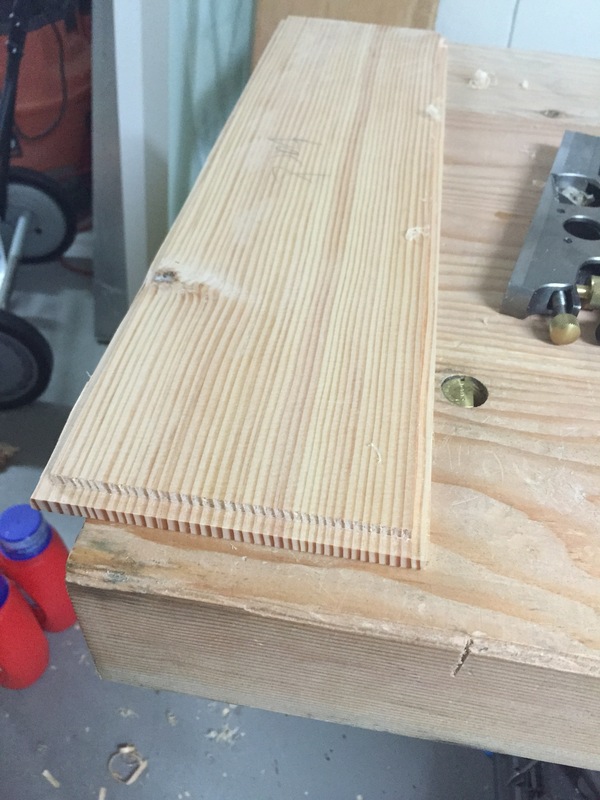 I used a chisel to create a saw wall at the shoulder and I was amazed how well it worked. 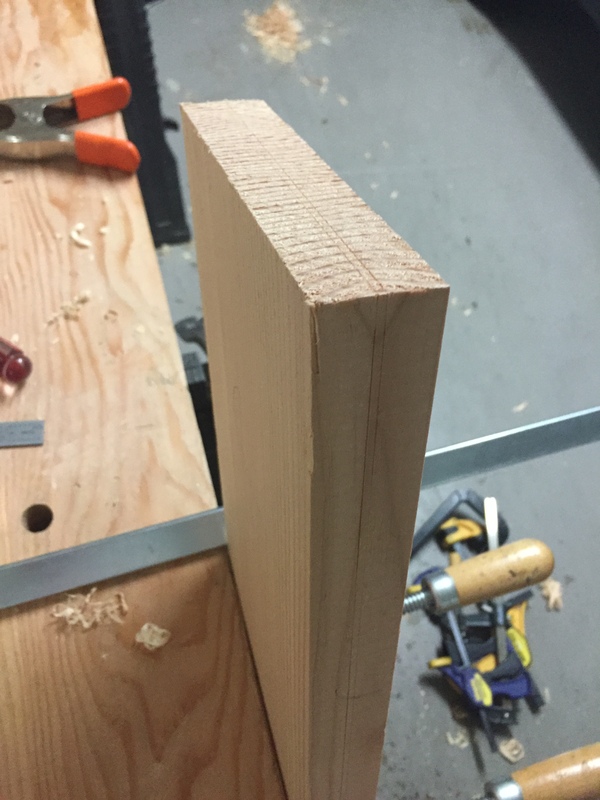 I also finally realized I am a moron since I have been battling with clamps to saw the tenon cheeks when I have a perfectly good Moxon vise. 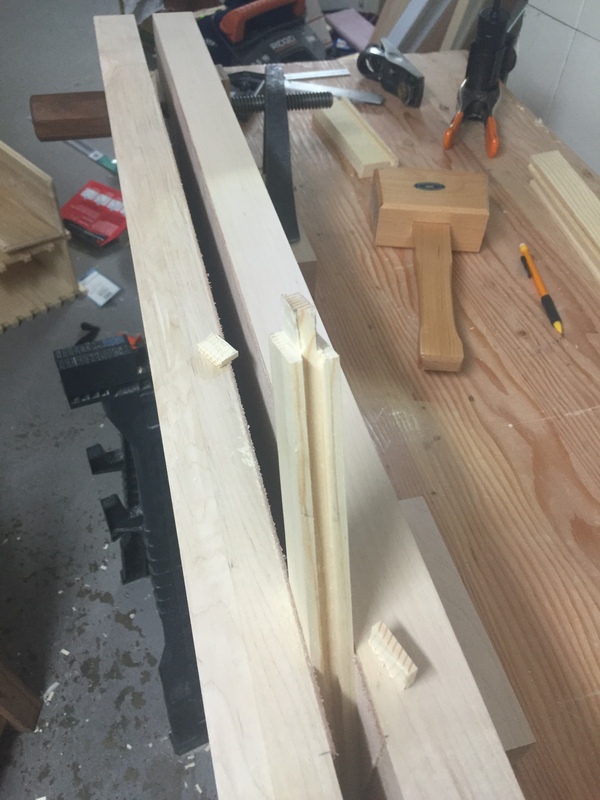 If you are a hand tool person and you don’t have a Moxon vise buy or build one, they are awesome. Rather than cutting these tenons down to tiny stubs I decided to chop two more mortises in the upper back panel which will also help to keep things in place. After a test fitting and some minor adjustments it was time to glue the middle divider to its corresponding back panel. Tonight the top of the carcass will get the same treatment.